Briefing reporters on the details of Osama bin Laden's killing in Pakistan, the White House's Deputy National Security Adviser, John Brennan, remarked optimistically that "bin Laden's dead. The al-Qaeda narrative's becoming increasingly bankrupt." Financially, al-Qaeda may be heading for bankruptcy too. The terrorist network has been hit by a double whammy: the death of its charismatic leader and the Arab Spring, the popular and democratic uprising against cutthroat despots. No longer can al-Qaeda and its offspring sell itself to Muslims as the sole alternative to tyrannical regimes. It doesn't cost much to run a terrorist organization. A few hundred bucks will buy a suicide vest, and the 9/11 commission estimates that al-Qaeda forked out less than $500,000 to bring down the Twin Towers of the World Trade Center and to strike at the Pentagon. But antiterrorism experts say al-Qaeda still needs funds to buy weapons; pay protection money to the rapacious Pakistan militant groups giving them shelter; feed and lodge its hundreds of militants and sympathizers hiding along the Afghanistan-Pakistan border; and run its propaganda arm, which includes several websites and as-Sahab, a video production company that is believed to be based in Pakistan. These costs are nowhere near the $30 million annually that al-Qaeda was raking in and spending before 9/11, says the CIA, but they do add up to several million. The main source of al-Qaeda's revenue doesn't come from Afghan heroin  the Taliban keep that to themselves  nor from bin Laden's personal wealth. The son of a billionaire construction magnate, bin Laden was cut off from his family fortune in the mid-1990s. Nor have antiterrorism investigators been able to find any financial ties linking al-Qaeda to any state, be it Iraq or Saudi Arabia. Since 9/11, al-Qaeda has financed itself through private donors, large and small. The large are rich and sympathetic private individuals in the Gulf. The small are numerous; throughout the Islamic world, some Muslims inspired by bin Laden's anti-Western rhetoric choose to fulfill their vow of zakat, or charity, by giving alms to organizations loosely tied to al-Qaeda. The telegenic figure of bin Laden was always the main draw. His myth, that of the giant, soft-spoken warrior who gave up palatial luxuries for jihad, resonated with many rich Gulf sheiks who eased their conscience by sending a pile of cash his way. It was easier than picking up an AK-47 and following bin Laden into the snowy Afghan wastes. From Casablanca to Peshawar in Pakistan, young, impressionable Muslims carry photos of bin Laden on their cell phones. They would download his sermons from as-Sahab and extremist websites, whenever he managed to smuggle them out. But now, bin Laden is dead. His portly sidekick, the Egyptian physician and ideologue, Ayman al-Zawahiri, may be cannier than bin Laden ever was, but he certainly lacks his master's magnetism. Al-Zawahiri is known to be arrogant, quarrelsome and long-winded in his video rants, not the kind of terrorist to endear himself to potential followers and induce them to reach into their pockets. 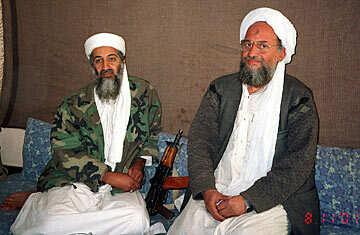 With bin Laden secluded in his Abbottabad mansion, it was up to al-Zawahiri to drum up followers and money. It did not go well. In an August 2009 video, al-Zawahiri beseeched al-Qaeda supporters in Pakistan to "back the jihad and mujahedin with your persons, wealth, opinion, expertise, information and prayers." Last year, one of his cohorts, Mustafa Abu al-Yazid, appeared on a website pleading for cash: "If a holy fighter does not have the money to get weapons, food, drink and the materials for jihad, he cannot fight jihad." And some newspaper reports claim that wannabe European jihadists who showed up at al-Qaeda training camps in Pakistan were charged $1,200. Al-Qaeda was also crippled by a post-9/11 U.S.-led global squeeze on banks and financial institutions suspected of aiding the terrorist network. Undaunted, al-Qaeda then relied on cash couriers, many of them were Pashtuns from the tribal areas. During their years in hiding after 9/11, scores of al-Qaeda fighters married into the local Pashtun clans. Arrangements were made for these Pashtun relatives to pick up suitcases of cash from Gulf sympathizers during the annual hajj pilgrimage to Mecca and pass them back to al-Qaeda, according to a tribal elder in South Waziristan. But that was a mere trickle compared with the millions that used to reach al-Qaeda before the banks cracked down. In other words, al-Qaeda is strapped for cash. And that was even before it lost bin Laden, the star attraction.